This new undertaking (by Amazon Prime) of Tom Clancy’s blockbuster Jack Ryan series pays off big-time. 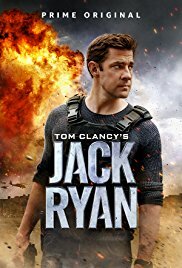 John Krasinski as a boyish Jack Ryan adds unexpected dimension to this eight-episode series focused on a terrorist plot in Syria. If this is your genre, you will inevitably make a comparison with Clancy’s books and the older cinematic depictions of Jack Ryan. However, standing on its own, the new Jack Ryan series is riveting, albeit with some graphic violence and cultural stereotyping. Reluctantly drafted into being a CIA operative instead of a number-crunching budget analyst by demoted CIA director James Greer (the wonderful Wendell Pierce of “The Wire”), Ryan soon learns that the CIA bureaucracy is no different from any other. His analytical skills are mostly ignored, although always proved right later on. Greer is his reluctant mentor. Add a romantic subplot with Dr. Cathy Mueller (Abbie Cornish from “Three Billboards outside Ebbings, Missouri”) and you have a complex thirty-something bureaucrat trying to fit into the CIA at the same time he wants a balanced life. In addition, the terrorist master-mind has a family and provides additional complexity to the plot. Note: Confession–I’ve only seen Jack Ryan in film, and have not read any of the books, but my husband has and loved the dramatization with Krasinski. Highly skewed reviews online from one-star to five-star (influenced by the political divide currently perhaps?) Judge for yourself! I can’t wait for season 2 next year. The Guernsey Literary and Potato Peel Pie Society is a Netflix historical drama based on the 2008 historical best-selling novel of the same name by Mary Anne Shaffer and Annie Barrows. Set on the island of Guernsey in the English Channel, a year after the end of the Second World War, we see Julie Ashton (the talented Lily James –Lady Rose in “Downton Abbey”), a London author writing under a male pen name. She yearns for a writing project in her own voice. Ashton gets a letter from Dawsey Adams, a Guernsey pig farmer, who has a used book with her name and address. Exchanging letters with residents on the island of Guernsey, which endured Nazi occupation, Ashton accepts an invitation to read to the Guernsey Literary and Potato Peel Pie Society, a book club that was actually part of the underground resistance. Intrigued by how much books mean to this isolated community, how reading kept everyone sane during the war, Ashton decides this book club and its history would be the perfect subject for a London Times article, the writing project of her dreams. But all is not as it seems. There is betrayal, a romance or two, and escape into the world of books for solace. The original Guernsey novel is completely in a “letters” or epistolary format, mostly letters between Ashton and Adams, so the visual and sense of place is severely lacking. The film’s best moments, on the other hand, provide a keen sense of 1946 island life in a small British community. There is a sense of community after suffering a shared loss during the Nazi occupation. The Guernsey book club is similar in feel and sense of identity and community as “Downton Abbey”. We see the bravery of the underground as they resisted the Nazis and yet we come to understand the price of war for all involved and the need for forgiveness. A feel-good movie with three other “Downton Abbey” actors in key roles, The Guernsey Literary and Potato Peel Pie Society is entertaining, although not as engaging as the “Downton Abbey” PBS series. Mr. Mercedes, an Audience (DirecTV) mystery-thriller original series, is based on the Stephen King trilogy “Mr. Mercedes”, “Finders Keepers” and “End of Watch”. The macabre master again conjures alarming boundary-breaking drama, this time in economically depressed Bridgton, Ohio. The opening scene is horrific: a Mercedes sedan mows down a crowd of job-seekers waiting late at night for the next morning’s job fair to open. A few of those waiting in line have babies. A massacre occurs, but the viewer does not know who the driver is or what motivates him or her. 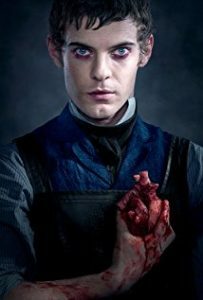 Soon we meet Brady, the toxic male sociopath rivaling Norman Bates of “Bates Motel”, (played by an astonishing Harry Treadaway), pressured by a seething rage, the source of which is a seriously sick relationship with his mother. Brady is part Mr. Robot, dwelling in the basement, plotting cyber revenge on the world. And the main character and investigator who, for the second time, has to solve the crime is a disheveled drunk but nevertheless rather appealing Bill Hodges (Brendan Gleeson), who retired after unsuccessfully investigating the “Mercedes Massacre” years ago. Slowly Brady boldly begins to reveal himself, through cyber messages to Hodges, promising another attack. For the retired detective, Brady provides the opportunity to redeem himself by proving once and for all that the Mercedes massacre can be solved. And as for Brady, he craves validation and recognition, wanting to assert his own dominance over others. The two–Brady and Hodges– play off each other’s unhealed wounds. As the episodes in the first season progress, viewers learn just how obsessive both Hodges and Brady are. In the second season, now being broadcast (but not completed), we see Brady suffering locked-in syndrome, a condition in which the mind is aware but cannot move or communicate verbally due to complete paralysis. What is happening inside Brady’s mind? Will he maintain his sick mental state or morph into a new one? Visceral and emotional turmoil seem to be sustained in season two, with science fiction strongly inserted as only Stephen King can. 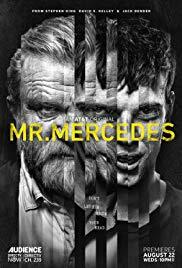 I naturally wonder if Mr. Mercedes can maintain the horror and suspense. Highly recommend season one and will withhold my assessment of the current season until the finale! Note: Only available as Audience streaming to DirecTV subscribers at the time of this writing. 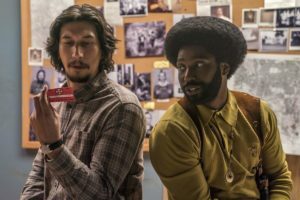 “BlacKkKlansman”: Part of the American Fabric? 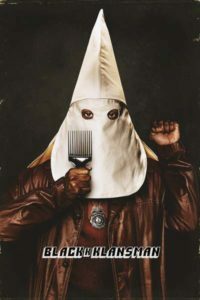 A Spike Lee film about white supremacy, BlacKkKlansman is based on Ron Stallworth’s 2006 memoir, which eviscerates the hideous social structures of racism in the US. Assigned to be an undercover cop at a black power student rally, Stallworth is to gather intelligence in what his boss implies may be a terrorist movement. Stokely Carmichael, Black Panther leader, will be giving a speech. The rookie police officer is deeply affected as he watches young black college students take pride in what Carmichael is saying. He understands their rhetoric but his superiors are threatened by the Black Panther political movement. Stallworth suggests that the real terrorism stems from the KKK as well as perhaps the Black Panthers. Both are kindling for explosive violence. With footage from the notorious 1915 film, “The Birth of a Nation”,– a homage to the Ku Klux Klan,– we are pulled into a clandestine operation where Ron’s colleague, Flip Zimmerman (an endearing Adam Driver), goes undercover as the white version of Ron at KKK meetings. Scenes of Flip’s own victimization by Klansman for suspecting he is a Jew triggers the empathy he has for Stallworth’s experience. Toward the end of the movie, Spike Lee uses original footage of the horrific scenes of the Unite the Right rally and Heather Heyer’s death in Charlottesville, Virginia, to show that little has changed from the racism of the 70s. BlacKkKlansman’s terrifying message is loud and clear: What you see is a story taking place in 1979, but this is not only a period piece about those days. That was then but also here now too. Little has changed. BlacKkKlansman is both a conversation-starter and conversation stopper. It will leave you deeply moved! Note: BlacKkKlansman opened in theaters on the anniversary weekend of Heather Heyer’s death.